I spent all yesterday at the Silicon Valley Association of Realtors. It's the local branch of the NAR. My day consisted of an orientation, swearing an oath, and an ethics class. Nothing dealing with green issues was discussed there, so why am I writing about it? Because we had a power outage. All the presentations centered around PowerPoint, so they were about to send us home. The lights came back on just as they had us all raise our hands for the oath. This lead me to a brief contemplation of the energy generated from Realtor armpits. Nevertheless, the power was on again, so we had to go back to our ethics class with the caveat: "This always happens in the summer". How quickly we get used to things instead of doing something to fix them. We just deal with rolling blackouts and shrug our shoulders. No big deal. Perhaps power outages will become so commonplace, people will learn to give a presentation without a slide show projecting exactly what they are saying. Why not just skip to doing things that do not require power to avoid causing the power drain? Granted, a PowerPoint presentation is not putting strain on the grid, but air conditioners are. If we have to get used to rolling blackouts because they happen every summer, we will have to insulate our houses, and make sure we have good East/West ventilation to keep our houses from cooking us. Why not just keep our houses cool that way, and leave the air conditioners off? Why does it take catastrophe to change? 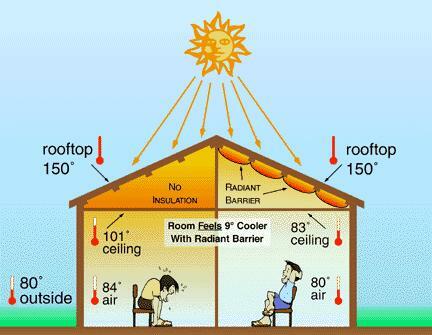 Good insulation is much cheaper than running an air conditioner. Why doesn't saving money spur change? If change is inevitable, why is it resisted? In any case, change really is inevitable, and it doesn't matter what spurred it's arrival. I look forward to when proclaiming myself a "green" real estate agent is obsolete. Eventually all homes will have to be fixed up for energy efficiency and clean indoor air before they are sold. In the mean time, I am banking on the hope that there are other people like me eager to make the change before they have to.